Dave, from the Wexford Mountains, as previously mentioned managed to score himself a bottle of Black's Black IPA from his local SuperValu and was impressed enough to ask me to do another brew, but this time of a black IPA. I had a feeling that Dave was associating the flavour with the colour, whereas that's not the case. What makes Black's Black IPA so unique (and yummy) is the dank and cat-pissy hops: Citra and especially Galaxy. I didn't have any Galaxy, so I decided rather than clone Black's brew I'd plough my own furrow. 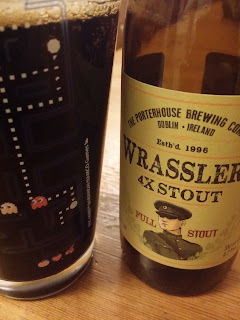 I resurrected a recipe for a porter I made with home roasted malt that was truly amazing (someone, I don't remember who, compared it to bottled Wrassler's, but I didn't get that) and subbed in Carafa III for the the roasted malt. The original had just Mosaic and Summit so I decided to stick with that combination but just up the quantity. I had intended on sticking with my favourite yeast, WLP-644, but I got caught short and had to use some dried Mauribrew 514. I picked up a 500g block of this a few years ago, which has been in the fridge since, and it has bailed me out a few times. One thing I have found about this yeast though is that despite claims (which I can't verify) of attenuation in the 80s, it has never broken the 75% barrier for me. The resulting beer came out black as expected, and Dave's had a greater degree of dankness, whereas mine was a bit smoother with orangey Amarillo flavour. Surprisingly I preferred mine, as while neither were close to Black's, mine was further from it. One thing I would probably not do again was the flaked barley. This left a silky smoothness that doesn't seem quite right in a beer like this, so I'd omit it if brewing again. Certainly a lot of truth to that Steve. When I first had Black's BIPA I assumed the dankness was Simcoe, but like everyone else, Black's are also suffering its high demand and short supply. I did manage to snag some myself though, so the next BIPA might get it.